Destined to be a classic, DIL SE is a truly brilliant beautiful film by Mani Ratnam, a creative genius and one of the greatest living film directors – and not just in India. Ratnam is right up there with the all time best: Michelangelo Antonioni’s The Red Desert, Bernado Bertolucci’s The Conformist, and Francois Truffaut’s The Four Hundred Blows. 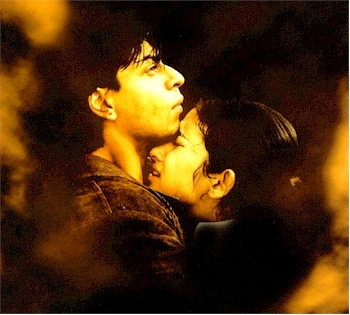 Most viewers think of DIL SE as a love story, but I saw it as the perfect metaphor for the Soul’s surrender to God. The hero falls in love with a girl he sees by chance one night in a lonely rural railway station. He has no idea that she is a terrorist and loses himself in love to her completely. It is my feeling that his relationship with this girl is purely metaphorical for the soul's ultimate surrender to God. The idea that the soul must give up everything - including it's own illusory existence - to God is an idea found in both Sufism, Hinduism's Bhakti Yoga, and Christian mysticism. At the end of DIL SE, the Soul has become ONE with the Beloved. Their Sacred Union is immutable. AR Rahman wrote the music in this film and the songs were enormously popular all around the world. People – like me - sang them even when they couldn’t understand the Hindi lyrics. Rahman, also a genius, is acknowledged by musicians everywhere as one of the truly great composers of music in our times. Like so many millions, I love Rahman’s music! Feet jingling (i.e., with anklets), walk in the shadow. who is my evening, my night, my resurrection. I don’t believe this film is about terrorism. This extreme aberrant of the human experience is used as a dramatic environment to allow Mani Ratnam a creative ‘tour de force’ to reveal one of life’s great mysteries: Our eternal sense of separation and longing. The unforgettable night scene up in the mountains set to haunting music and bathed in transcendental blue light is a cinematic classic. Alone at last with his beloved, for one sweet moment our love-struck hero melts her icy defenses. Intense close-ups fill the screen and invite us to journey into their eyes, their tender smiles, and subtle expressions. Here Mani Ratnam expresses something deeper, something eternal about the human condition itself – the essence of what drives us all, the space that allows us the adventure into the unknown. The pursuit of his elusive beloved - to the death - is not about some lovesick fool, but rather reflects the underlying universal reality of all our lives and what it means to be human, to long for something that seems to be always somehow beyond us. In comparison to the empty, soulless, 'special effects' rubbish cranked out of bottom-line-Hollywood year after year, I loved DIL SE, yes, with all my heart. The acting in the last scene of DIL SE is something I will never forget. Shahrukh Khan’s volcanic presence often seems to bring out the best in the other actors. Manisha Koirala was awesome - perfect as the no-make-up mountain village girl. It takes a lot of confidence for a beautiful woman to allow herself to be photographed with so much pain written in her face. 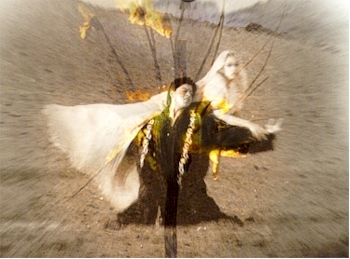 At the end of the film our hero, beaten and bloody, approaches his beloved who has explosives hidden under her clothing. She has accepted her martyrdom and is headed for death. Knowing she is a walking timebomb and concerned for his safety, she warns him to stay away. Determined to fulfill her suicide mission, she tries to get by him and he lunges, grabbing her arm. He pulls her to him, holding her from behind, he can feel the explosives – but he doesn’t care. He stopped caring about that long ago. He has made his decision. Her eyes are wild with fear – she’s freaking out now. Once again, he is passive. He will not be the one to ‘take’ her. He is surrendering to her Will. Here is a passive expression, again of surrender from a normally willful man. He holds onto her, ever tighter. Her face is twisted by her anguish and pain, tears streaming down her cheeks. He turns her around to face him – tears in his eyes and blood on his face. Once more begging her, his bloodstained bandaged hand reaches for hers and desperate to feel her touch, he places her hand on his face. Their eyes are locked in a silence that for them must reflect the slowing of time, as they both know they have only a few seconds left of life. She looks deeply into him and with the least possible motion, nods lovingly, teary eyed – a new tenderness comes into her face, her eyes shinning with love for such a brief moment. She moves her head gently to almost nestle into him – a subtle demonstration of her final surrender to him and his love for her, which has at last overpowered her. They embrace – after enduring the pain of so long a separation. They are now completely ONE. And in what may be his greatest moment of acting genius, to my knowledge, Shahrukh makes a series of the most amazingly subtle and intelligent expressions I have ever seen. In what can only be a few seconds, he makes a timeless expression of a profound and deeply felt acceptance of this their tragic moment – and in defiance of their fate and impinging death, he simultaneously holds onto her as if to protect her within the strength of his tender embrace and undying love, as they move together into Death. Let me sleep in the lap of death! You of the many colors, of the many-colored soul. Those of you who understand the idea of spiritual surrender in Bhakti Yoga and Sufism will love this film. Santosh Sivan’s camera work is, as the Planet Bollywood reviewer says is simply stunning. For those of us who will probably never visit Ladakh, Sivan’s images will remain etched in our hearts, inspirational. SRK’s acting in this film was superb - at once a mix of his endearing, boyish vulnerability, tenderness, and wild explosive impulsiveness that characterize the intelligence of this immensely popular actor. The critics often say this is A.R. Rahman's best film score. Farah Khan’s choreography is at its original imaginative heights. Who can forget the dance in SATRANGI RE, the stunning images of passionate anguish, ‘love is an uncontrollable fire’. and I was infatuated; it filled my heart. You, only you, you are all the sweetness of living! The flame of your body fires my breath; desire urges me onward. You, only you... You are all the sweetness of living. You, only you... You are my longing, longing itself! You touch me like a whisper, your eyes softened by silence. On the floor I make my prayers, some conscious, some unconscious. Or SRK’s contagious energy, igniting rhythms on top of that train dancing to CHAIYYA CHAIYYA. WAH! What a scene! Or tenderly protecting Manisha in the get-up-and-dance song, ‘the heart, it’s a sweet hardship’ DIL SE RE? HUB…their eyes meet, it is like a touch…a spark…Attraction. UNS…the touch of the eyes was as if, it was infatuation. ISHQ…the flame of the body is felt, his breath starts igniting…Love. IBADAAT…he is entangled on her path…entangled in her arms…Love turns to worship. DIL SE…a journey through these seven shades. than these subtle confusing allusions. Or a night without the moon. The pain of absence eats my heart. No food by day, no sleep by night. No words pass my lips either. Who will listen to me? To whom can I speak? Come, my Beloved, and quench my pain. Why do You torment me, O Inner Ruler? If You came, my pain would go. Mira is you servant, her Love has run for many births. Every day I rise early and wait for Him in expectation. I am caught in the net of longing. Show me Thy compassion soon, my Master. Am I not Thy slave? My breath will hardly emerge from my body. "When will Hari [Krishna] keep me by his side?" Why do You still make mischief? O Master of Mira, When will You come? Your coming will fulfill all my desires. The love that does not overwhelm – is no LOVE. Love is not to be found in the ephemeral physical containers…the body draws a limit when Love desires to fly free into the realms of boundless, limitless JOY! A spirit of submission [surrender] acts as a true guide to deeper Knowledge. The end of all Knowledge lies mute and still in Love. The experience and consummation is THE thing – and not the object that helps give the experience. If you should choose to take God on as your Beloved, you will find yourself opening a 'door' to an adventure that has no ending. They say that in the Kali Yuga, Bhakti Yoga is the most effective way to reach Union and ONENESS with God. This is because whatever Knowledge of universal truths and metaphysics there is in the Kali is likely to be contaminated and confused by the dense frequencies of this Cycle of Time - and thus slow the seeker down on the Path Home. The Path through the Heart is considered pure - and safer.